There are three common methods of allergy skin testing. Placing a small amount of substances that may be causing your symptoms on the skin, most often on the forearm, upper arm, or back. The skin is then pricked so the allergen goes under the skin's surface. The health care provider closely watches the skin for swelling and redness or other signs of a reaction. Results are usually seen within 15 to 20 minutes. Several allergens can be tested at the same time. Allergens are substances that cause an allergic reaction. Injecting a small amount of allergen into the skin. The provider then watches for a reaction at the site. This test is more likely to be used to find out if you're allergic to bee venom or penicillin. Or it may be used if the skin prick test was negative and the provider still thinks that you're allergic to the allergen. Possible allergens are taped to the skin for 48 hours. The provider will look at the area in 72 to 96 hours. Allergy medicines can change the results of skin tests. Your provider will tell you which medicines to avoid and when to stop taking them before the test. Skin tests may cause very mild discomfort when the skin is pricked. You may have symptoms such as itching, a stuffy nose, red watery eyes, or a skin rash if you're allergic to the substance in the test. In rare cases, people can have a whole-body allergic reaction (called anaphylaxis), which can be life threatening. This usually only occurs with intradermal testing. Your provider will be prepared to treat this serious response. 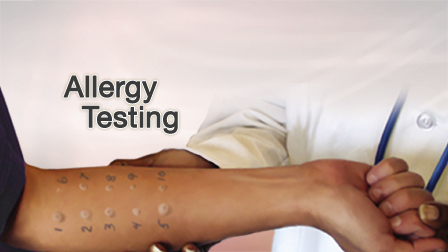 Allergy tests are done to find out which substances are causing your allergy symptoms. Allergies to penicillin and related medicines are the only drug allergies that can be tested using skin tests. Skin tests for allergies to other drugs can be dangerous. 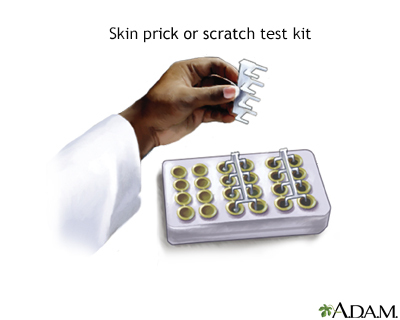 The skin prick test may also be used to diagnose food allergies. 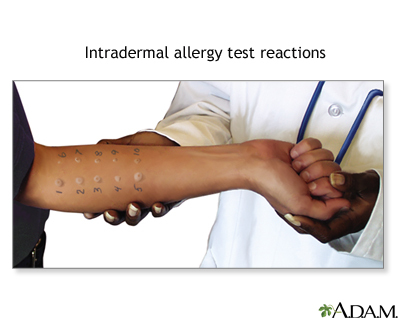 Intradermal tests are not used to test for food allergies because of high false-positive results and the danger of causing a severe allergic reaction. A negative test result means there were no skin changes in response to the allergen. This negative reaction most often means that you are not allergic to the substance. In rare cases, a person may have a negative allergy test and still be allergic to the substance. A positive result means you reacted to a substance. Your provider will see a red, raised area called a wheal. Often, a positive result means the symptoms you're having are due to exposure to that substance. A stronger response means you are likely more sensitive to the substance. People can have a positive response to a substance with allergy skin testing, but not have any problems with that substance in everyday life. Skin tests are usually accurate. But, if the dose of allergen is large, even people who are not allergic will have a positive reaction. Your provider will consider your symptoms and the results of your skin test to suggest lifestyle changes you can make to avoid substances that may be causing your symptoms. Homburger HA, Hamilton RG. Allergic diseases. In: McPherson RA, Pincus MR, eds. Henry's Clinical Diagnosis and Management by Laboratory Methods. 23rd ed. Philadelphia, PA: Elsevier; 2016:chap 55.